What Are The Common Health Risks Of Driving For A Living? All jobs have their own particular occupational hazards, but some have more than others. While driving for a living usually pays decent money and gives you the great sense of freedom of the road while you work, the flip side of it is that health-wise the risks for drivers — especially long-haul drivers — are higher than for those in regular 9 to 5 jobs. What do stats tell us about the overall health of drivers? A recent National Institute for Occupational Safety and Health (NIOSH) study published in the American Journal of Industrial Medicine, entitled “Obesity and Other Risk Factors: The National Survey of U.S. Long-Haul Truck Driver Health and Injury”, showed a “constellation of chronic disease risk factors” in long-haul drivers, such as high blood pressure, high cholesterol, obesity, smoking, physical inactivity and insufficient sleep. The study showed that truck drivers are twice as likely to be obese in comparison to the rest of the U.S. working population. 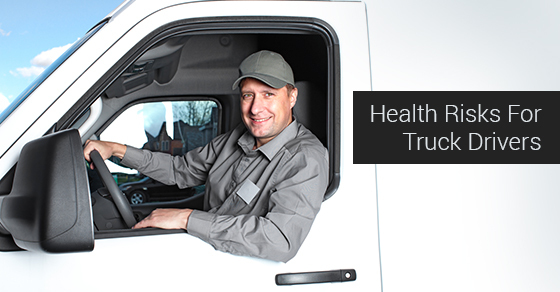 At the root of these health issues is most likely a trucker’s on-the-road lifestyle. Pressed to deliver as quickly as possible, truck drivers face long hours of sitting behind the wheel without activity, eating fast food on the run, and inadequate sleeping hours. All of these factors can lead to obesity and coronary problems. The NIOSH survey revealed that over two-thirds of respondents to this survey were obese (69 per cent) and 17 per cent were morbidly obese. In comparison, only one-third of those working “non-trucking” jobs were reported to be obese and 7 per cent morbidly obese. All medical evidence suggests that obesity increases the chance for heart disease, joint and back pain, type 2 diabetes, sleep apnea, cancer, and stroke. And certainly, the fact that many truck drivers are cigarette smokers and average only about six hours or less of sleep each night, only increases all the health risks. According to the survey, more than half of long-haul truck drivers were cigarette smokers — over twice the general working population (51 per cent versus 19 per cent). What can be done to counter these health risks? Given their mandate, truck drivers’ on-the-road lifestyle is understandable — it’s hard to be physically active while on the road for a long time, and fast food and cigarettes can provide comfort. Still, the potential diseases and health issues caused by this lifestyle, such as type 2 diabetes, heart disease, cancer, joint and back pain, and stroke not only place truck drivers at a grave health risk, but can also cause their careers to come to a screeching halt. To help their employees switch to a healthier lifestyle some trucking companies have implemented such initiatives as replacing sugar soda in the vending machines at the facility with healthier alternatives, offering financial incentives for weight loss, and providing access to wellness programs. Some are even providing special air masks to their drivers who have sleep apnea to help them improve their sleep. But the final responsibility for a healthier lifestyle lies with each driver. To keep active, consider working out at loading stations, walking laps around your rig (32 times around an 18-wheeler equals a mile), and exercising between jobs. Medical research has shown that physical activity can reduce the risk of many diseases including, diabetes, cancer, high blood pressure, and heart disease, as well as help with depression, anxiety, and stress (and less stress will help you give cigarettes the boot). As for eating healthier while on the road, what about loading up a cooler with home-cooked healthy meals or choosing gravy-free, baked, roasted and green food items at restaurants on the road? And how about switching those french fries for a bowl of cereal or cooking chicken breasts on an electric grill in the cab? Staying healthy is not only important on a personal level; it is critical to retaining your career as a driver and to your future. You may some day want to start your own trucking operation — and that, as any new owner/operator will tell you, is very satisfying, but it sure takes a lot of energy!